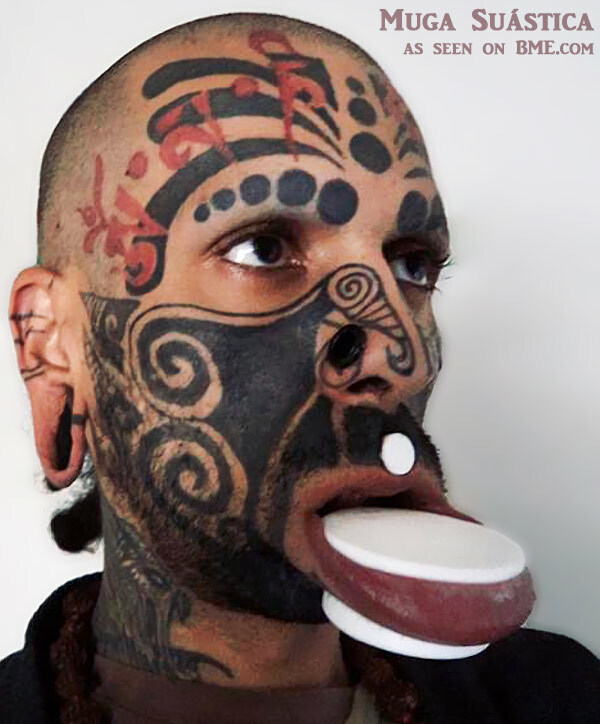 Even though numerous people outside of indigenous cultures have been wearing lip plates for at least a decade, it’s still a misunderstood and often maligned modification. I had a chance to talk to Neil Thomas about his lip plate, which began its life as a simple and unassuming 14ga labret seven years ago, and a lot of vinyl tape wrapping later, is now about 35mm (1 3/8″), just shy of his end goal of 45mm, where he plans on staying for a while. Because of the weight (and size) of the jewelry, he wears the plate down all the time, other than taking out a few hours a night and oiling the area, and to clean it with unscented anti-bacterial soap. He also tells me that he’s always loved the way it looked on all kinds of different people, so let me also share a picture of the amazing Muga Suástica of Marcolino Moura in Bahia, Brazil. His lip is 50mm (2″) in this photo, but he tells me he doesn’t plan on stopping any time soon. This entry was posted in ModBlog and tagged Lip Plates by Shannon Larratt. Bookmark the permalink. Thanks for these photos and stories, Shannon. Such wonderful lip plates! Most inspiring. I think it looks as awesome. Wish I had the guts to do that.